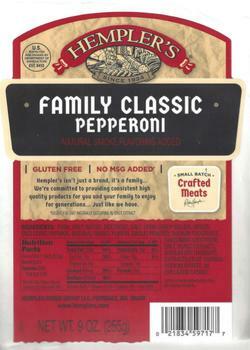 Hempler Foods Group of Ferndale, Wash., is recalling approximately 8,535 pounds of ready-to-eat pepperoni sticks. The recalled products, bearing establishment number “EST. 6410” inside the USDA mark of inspection, were shipped to distribution centers in California, Oregon, Utah and Washington, and then sent to retail stores. Consumers with questions about the recall may contact Arlie Jacobs at (360) 380-6684 or at Arlie.Jacobs@hemplers.com.